Awhile back Agent Ben reviewed Black Widow #1. He ended his read of the series there. I found myself wondering if I would agree with his comic file review, but being cautious and cheap I waited for the full Black Widow: The Finely Woven Thread by Nathan Edmondson with art by Phil Noto in a collected trade. Black Widow is a busy lady, and Nathan Edmondson shows us what she does with her downtime between Avengers and S.H.I.E.L.D. missions. She takes on for hire mercenary like missions where spy skills are desired. 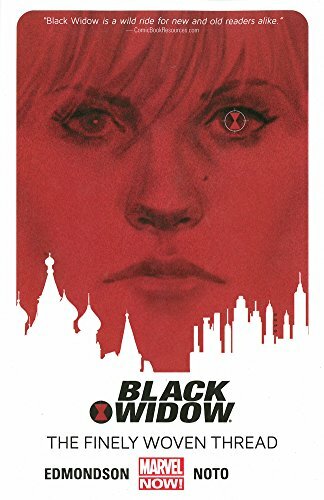 Black Widow travels the globe from Dubai, Shanghai, South American prisons and the Ukraine when no one else can help, and if they can find her, maybe they can hire the Black Widow. Along with taking on these missions, Black Widow works with her lawyer Isaiah to manage her earnings and fund her extensive network of safe houses and equipment drops. “No one will ever know my full story,” says Black Widow. And Edmondson makes this very clear! Along with her day jobs, Black Widow takes on a wide assortment of side jobs. These are for her not for-profit venture which funds a variety of trust funds and her support network. We can assume the trusts are for the victims or families of those impacted by her bad girl assassin days. She apparently cannot work out her inner demons and get redemptions just by saving the world from cosmic invasion with the Avengers or checking A.I.M. with S.H.I.E.L.D.. So she takes side jobs. Most of the adventures, with many only running an issue, are her solo self-selected assignments. But they do include a task from S.H.I.E.L.D. where the always pleasant Maria Hill is not afraid to deny her agent. I am hoping as a series that we get to see some of her story as she works out her sins in good deeds. Maybe we will not know all of her but a big chunk might be knowable. Like Hawkeye, this title attempts to make the hero more human. Hawkeye has Pizza Dog, Black Widow has a troublesome cat. Hawkeye has neighbors who invite him to barbeques, Black Widow has neighbors that deliver unrequested life advice. Now, Black Widow leaves town enough that the home life is not deeply influencing this book yet. But you can see the tracks of the domestic life which has helped Hawkeye be such as good book. Speaking of not knowing Black Widow, the opening script discusses Natasha Romanov. In the story she is referred to as Natasha Romanoff. Now, I have struggled at times with the spelling and I hoped this would be the definitive answer. It is her book! I guess better luck next time for Agent Daniel. The Noto art is fantastic. It has a light tone to it that somehow balances the hard personality of Romanoff. And the covers are excellent. Black Widow: The Finely Woven Thread gives us a cliffhanger where one might think bad things are happening in S.H.I.E.L.D., yeah I know shocking. I do think that Black Widow shows how successful and enjoyable a female led title can and should be. This really is James Bond stuff with a leading lady. And playing on her murky past this is a comic version of Black Widow that Marvel Cinematic Universe fans will feel is familiar. I really look forward to seeing what the next volume of Black Widow brings.